Iowa Senator Chuck Grassley says the Obama administration’s immigration policies “are hurting American families” and that’s the subject of the Senate Judiciary Committee hearing Grassley is chairing this morning. The Republican is also introducing legislation today that targets so-called sanctuary cities. 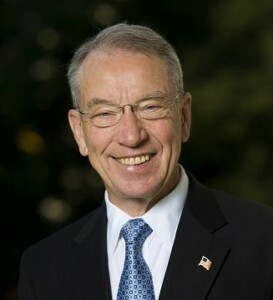 Obama administration officials are taking “far too much liberty and are essentially trying to write the laws themselves,” according to Grassley. The mayor of Davenport has pushed for months for that eastern Iowa city to become a sanctuary for undocumented immigrants, but the city council has not made the move official. Grassley says several Iowa communities are acting as sanctuaries, even though they’re undeclared. Public safety is being placed at risk by these sanctuaries, Grassley says, and changes need to be made at the federal level. “I’m introducing legislation today that will hold sanctuary jurisdictions accountable,” Grassley says. “It will require the executive branch to withhold certain federal funding if states or local law enforcement refuse to cooperate with the federal government in holding or transferring criminal aliens.” Among the officials scheduled to testify: Sarah Saldana, the Director of Immigration and Customs Enforcement, as well as Leon Rodriguez, the Director of Citizenship and Immigration Services. The hearing started at 9 A.M. central time.